In 1952 none of the branches of the United States Defence Force had any requirement for new aircraft. That did not stop McDonnell Douglas, whose internal studies had concluded that the Navy indeed needed a new aircraft and not only any aircraft, but a totally different aircraft type, an attack fighter. McDonnell Aircraft had begun work on revising its F3H Demon naval fighter, seeking expanded capabilities and better performance. On 19 September 1953 McDonnell Aircraft, who had been hard at work revising its F3H Demon naval fighter, approached the United States Navy (USN) with a proposal for the "Super Demon". The Navy was sufficiently interested to order a full-scale mock-up of the F3H-G/H, but felt that the upcoming Grumman XF9F-9 and Vought XF8U-1 already satisfied the need for a supersonic fighter. Unperturbed, McDonnell's design team reworked the design into an all-weather interceptor fighter-bomber capable of a top speed of over Mach 2.2 and able to carry more than 18,000 pounds (8,400 kg) of weapons on nine external hardpoints, including air-to-air missiles, air-to-ground missiles, and various bombs. On 25 July 1955, the Navy ordered two XF4H-1 test aircraft and five YF4H-1 pre-production examples. The Phantom made its maiden flight on 27 May 1958 with Robert C. Little at the controls. 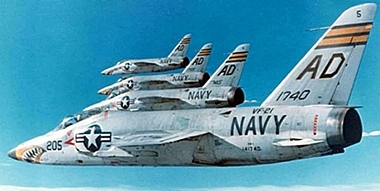 Carrier suitability trials took place in February 1960 with the first complete launch-recovery cycle performed on 15 February from the aircraft carrier Independence. In January 1962 the United States Air Force (USAF) borrowed two Naval F-4Bs and developed requirements for their own version. Unlike the navy's focus on interception, the USAF emphasized a fighter-bomber role. The first air force Phantom flew on 27 May 1963, exceeding Mach 2 on its maiden flight. To show off their new fighter, the USN led a series of record-breaking flights. All records were achieved in unmodified production aircraft. Five of the speed records remained unbeaten until the F-15 Eagle appeared in 1975. The first record, Operation Top Flight, took place on 6 December 1959 when the second XF4H-1 performed a zoom climb to a world record 98,557 feet (30,040 m). On 5 September 1960, an F4H-1 averaged 1,216.78 mph (1,958.16 km/h) over a 500 km (311 mi) closed-circuit course and on 25 September 1960, an F4H-1F averaged 1,390.24 mph (2,237.37 km/h) over a 100 km (62.1 mi) closed-circuit course. On 24 May 1961 during the 50th anniversary of Naval aviation Phantoms flew across the continental United States in under three hours and included several tanker refuelling's. The fastest of the aircraft averaged 869.74 mph (1,400.28 km/h) and completed the trip in 2 hours 47 minutes. On 18 May 1961Commander J.L. Felsman was killed during the first attempt to establish a record over a 3 mile (4.82 km) course whilst flying below 125 feet (38.1 m) at all times. On 28 August 1961, a F4H-1F Phantom II completed the course at an average speed of 1,452.777 kilometres per hour (902.714 miles per hour) setting a new world record. In air combat, the massive Phantom's greatest advantage was its thrust, which permitted a skilled pilot to engage and disengage from a fight at will. Early models had no internal canon and were instead armed with missiles that could be fired from beyond visual range. The lack of a cannon was finally addressed by adding an internally mounted 20 mm (.79 in) M61A1 Vulcan on the F-4E. The Phantom, however, lacked the agility of its Soviet opponents and was subject to adverse yaw during hard manoeuvring and was thus subject to irrecoverable spins during aileron rolls. USN Phantoms F-4Bs from the carrier Constellation made the first combat sortie of the Vietnam War on 5 August 1964. The first Phantom air-to-air victory of the war took place on 9 April 1965 when an F-4B from VF-96 "Fighting Falcons" piloted by Lieutenant (junior grade) Terence M. Murphy and his RIO, Ensign Ronald Fegan, shot down a Chinese MiG-17 "Fresco". On 10 May 1972, Lieutenant Randy "Duke" Cunningham and Lieutenant (junior grade) William P. Driscoll flying an F-4J, call sign "Showtime 100", shot down three MiG-17s to become the first American flying aces of the war. The US Marine Corps (USMC) received its first F-4Bs in June 1962. On 10 May 1965 Phantoms from the VMFA-531 'Gray Ghosts' were assigned to Da Nang airbase on South Vietnam's northeast coast initially assigned to provide air defence for the USMC but soon began close air support missions. Marine F-4 pilots claimed three enemy MiGs at the cost of 75 aircraft lost in combat, mostly to ground fire, and four in accidents. Photo reconnaissance mission with the RF-4B version started on on 3 November 1966 from Da Nang and remained there until 1970. The RF-4C was eventually operated by four squadrons and of the 83 losses, 72 were in combat including 38 over North Vietnam (seven to SAMs and 65 to AAA). The first USAF Phantom's in Vietnam were F-4Cs from the 555th "Triple Nickel" Tactical Fighter Squadron, which arrived in December 1964. 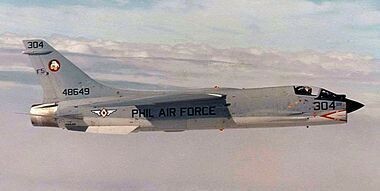 On 26 April 1966, an F-4C from the 480th Tactical Fighter Squadron scored the first aerial victory by a U.S. aircrew over a North Vietnamese MiG-21 "Fishbed". On 24 July 1965, another Phantom from the 45th Tactical Fighter Squadron became the first American aircraft to be downed by an enemy SAM, and on 5 October 1966 an 8th Tactical Fighter Wing F-4C became the first U.S. jet lost to an air-to-air missile, fired by a MiG-21. From the initial deployment of the F-4C to Southeast Asia, USAF Phantoms performed both air superiority and ground attack roles, supporting not only ground troops in South Vietnam but also conducting bombing sorties in Laos and North Vietnam. Phantoms eventually became the primary USAF tactical ordnance delivery system. Sixteen squadrons of Phantoms were permanently deployed between 1965 and 1973. 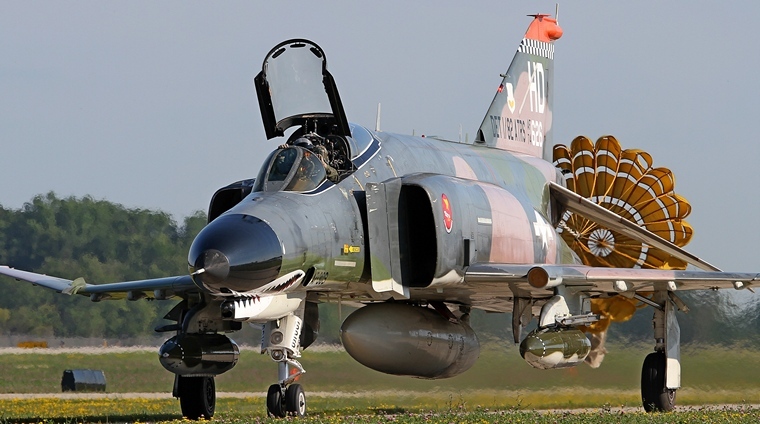 Peak numbers of combat F-4s occurred in 1972, when 353 were based in Thailand. A total of 445 USAF Phantom fighter-bombers were lost, 370 in combat and 193 of those over North Vietnam (33 to MiGs, 30 to SAMs, and 307 to AAA). By war's end, the U.S. Air Force had lost a total of 528 F-4 and RF-4C Phantoms. When combined with U.S. Navy and Marine Corps losses of 233 Phantoms, 761 F-4/RF-4 Phantoms were lost in the Vietnam War. On 15 August 1990, 24 F-4G Wild Weasel Vs and six RF-4Cs were deployed to Shaikh Isa AB, Bahrain, for Operation Desert Storm. The F-4G was the only aircraft in the USAF inventory equipped for the Suppression of Enemy Air Defences (SEAD) role, and was needed to protect coalition aircraft from Iraq's extensive air defence system. The RF-4C was the only aircraft equipped with the ultra-long-range KS-127 LOROP (long-range oblique photography) camera, and was used for a variety of reconnaissance missions. In spite of flying almost daily missions, only one RF-4C was lost in a fatal accident before the start of hostilities. One F-4G was lost when enemy fire damaged the fuel tanks and the aircraft ran out of fuel near a friendly airbase. A large number of Phantoms QF-4's are still serving as the 82d Aerial Targets Squadron (ATRS) as target drones whilst some are maintained in historical colour schemes, being displayed as part of Air Combat Command's Heritage Flight at air shows. AF 626 illustrating this article was displayed at AirVenture 2015 and is one of the target drones operated by the 82nd ATRS. The Phantom has served with the air forces of many countries, including Australia, Egypt, Germany, United Kingdom, Greece, Iran, Israel, Japan, Spain, South Korea and Turkey. Islamic Republic of Iran Air Force Phantoms saw heavy action in the Iran-Iraq War in the 1980s. On 30 September 1980 two Iranian F-4s attacked the Iraqi Osirak nuclear reactor site near Baghdad and on 4 April 1981 during a strike by eight Iranian F-4s against the H-3 complex of air bases in the far west of Iraq many Iraqi aircraft were destroyed or damaged with no Iranian losses. 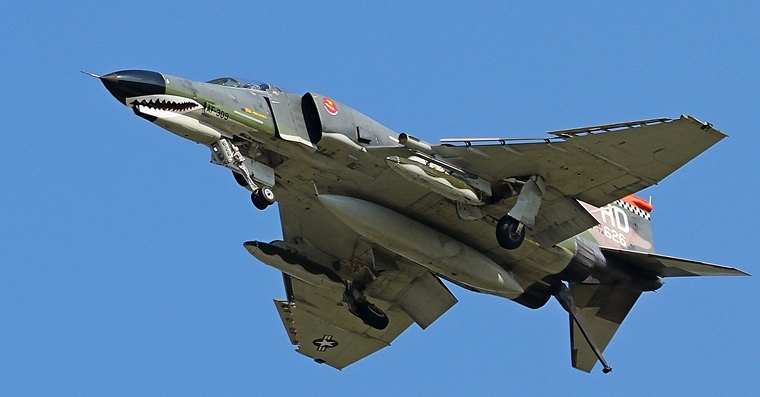 Turkish F-4s have been used to strike Kurdish PKK bases in Northern Iraq whilst on 22 June 2012 a Turkish RF-4E was shot down by Syrian air defences while flying a reconnaissance flight near the Turkish-Syrian border. 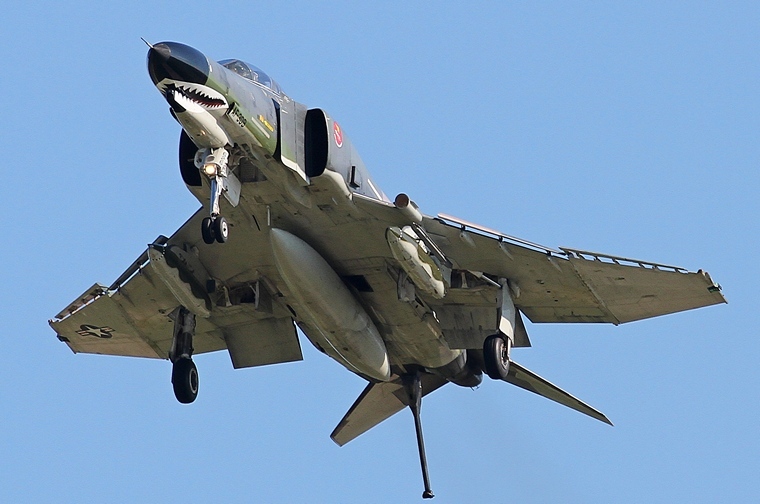 Turkish F-4s remained in use in 2015. Phantom II production ended in the United States in 1979 after 5,195 had been built (5,057 by McDonnell Douglas and 138 in Japan by Mitsubishi). Of these, 2,874 went to the USAF, 1,264 to the Navy and Marine Corps, and the rest to foreign customers. 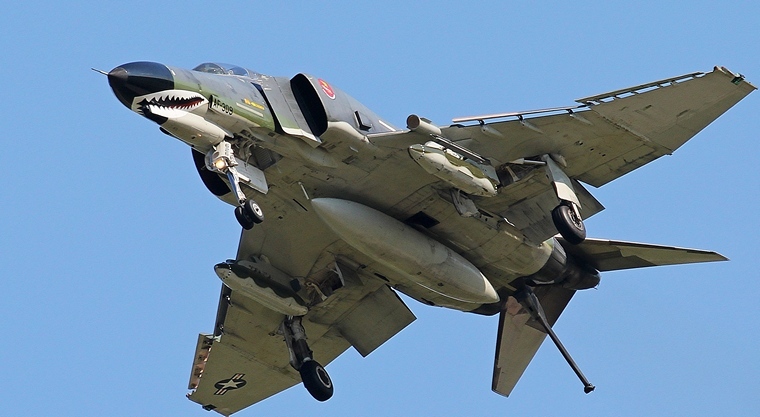 The last U.S.-built F-4 went to South Korea, while the last F-4 built was an F-4EJ built by Mitsubishi Heavy Industries in Japan and delivered on 20 May 1981.